We Played Musical Bedrooms… again! 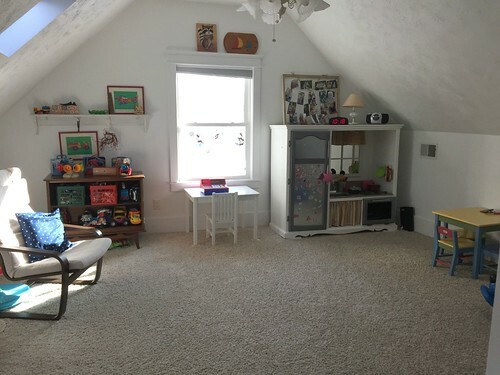 Remember this past summer, when I spent hours upon hours (while 7-8 months pregnant) painting, moving furniture, installing closets, hanging decorations, and sewing bedding in an effort to transform our upstairs bedrooms into fun places for our children to sleep, play, and hang out? 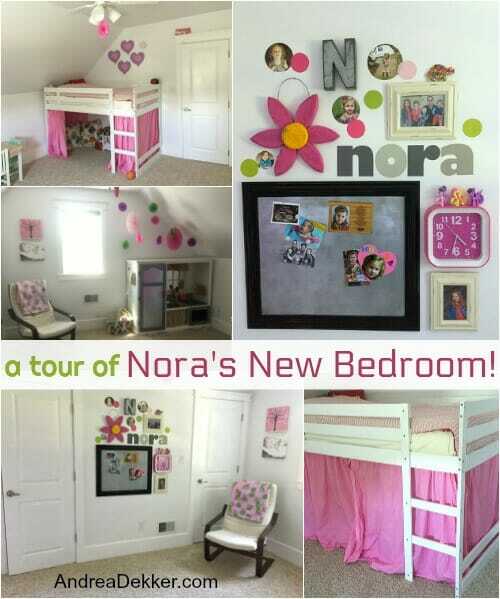 Here’s Nora fabulous bedroom before and after pictures. 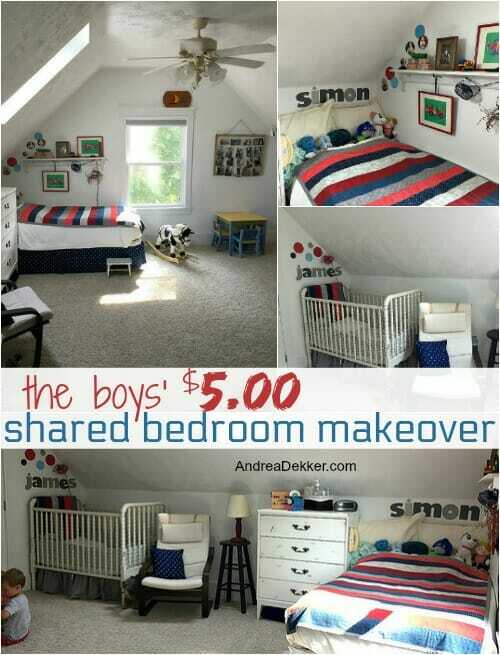 Here’s the cute room I set up for the boys. 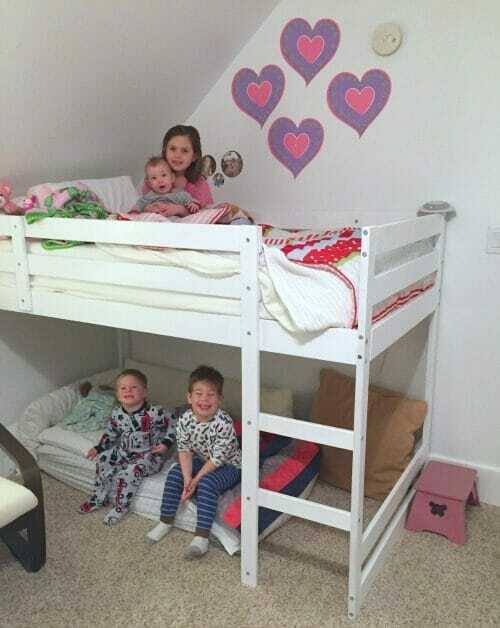 Seriously, their bedrooms were SO cute! Everyone loved their bedrooms, slept well, and we were all happy. Then, around Christmas time, Nora started waking up frequently every single night, crying that she was scared to sleep by herself. Since Nora has always been our “worst” sleeper, we didn’t really think much of it. However, after about a week of complaining she didn’t want to sleep by herself, we found her sleeping on the floor in the boys bedroom several days in a row. At the same time, James said he wanted to sleep in a big boy bed; so Dave and I decided we would move the bedrooms around… again! 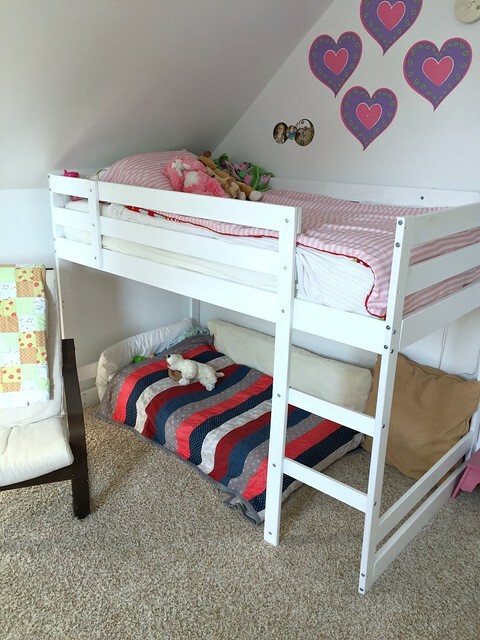 Since Nora’s mini loft/bunk bed wouldn’t fit in the boys bedroom (their ceiling is even more sloped than her ceiling is) we opted to put all 3 kids in Nora’s room for now. This way, James could sleep on the bottom of Nora’s bunk bed (which is essentially on the floor right now) so he won’t get hurt if he falls out of bed. We moved the play kitchen out and replaced it with Simon’s bed and the boys’ dresser. James sleeps under Nora’s bunk on his crib mattress. He LOVES sleeping under Nora’s bed and Nora loves having her brothers in her room. Nora’s clothing is still in the left closet and dress up clothing is still in the right closet. 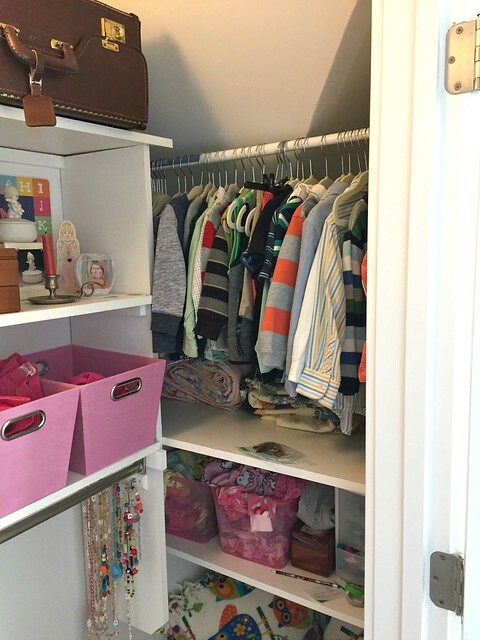 And even though most of the boys clothing is in the dresser, they still have a few things that need to be hung, so I put another rod in Nora’s closet for their dressier clothing. 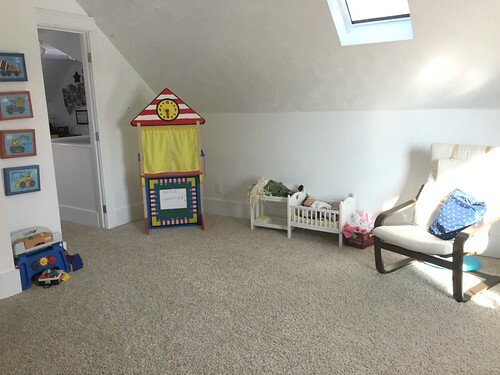 The boys old room is now a gigantic play area! 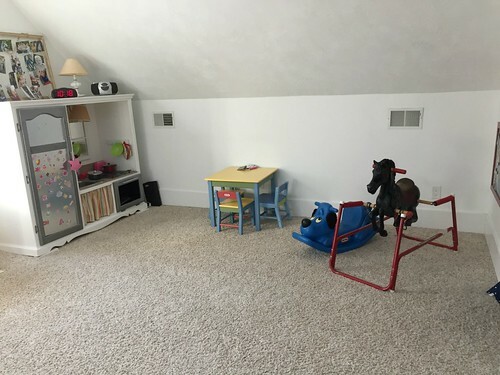 Part of me is annoyed that we rearranged everything only 5 months after I put so much work into their bedrooms… but it is sort of sweet to hear them all talking together at night. I figure it won’t be too much longer before Nora will want her own room again (or before Clara moves upstairs to share with her). So I’ll let them all enjoy their nightly bonding time for now! Oh, and in case you’re keeping track, this makes NINE different bedroom set-ups in the two upstairs bedrooms over the last 2.5 years! Good thing I really enjoy moving furniture! Our Master Bathroom - Before and After! I love that you always just use common sense and do what works for now! What you did wasn’t working, so you changed it. It’s totally darling that all the kids want to BE together and says volumes for you as parents. I get that you put all of the work in, but thankfully you didn’t spend a huge amount of money. 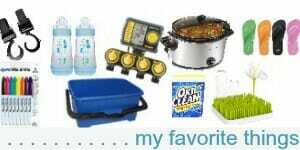 You keep it so practical and real each day. Kuddos to all of you for making the best of each situation and moving forth to what works, over forcing small minor issues. I applaud your continual attitude to change and adapt, improvise and overcome. These are the secrets in life to succeed in all areas. That ability to change, as needed. My brother-sister duo wanted to share a room at one point. Since they shared a bedtime it worked out fine. We moved them to the slightly larger room that accommodated both twin beds and moved the dressers to the other room, along with toys. It worked well for a couple years. Then we added on to our house and expanded one bedroom. At that point they decided to split up again. My daughter was ready for a pink girly room and my son for more privacy. Now my son will be leaving for college and his sister is planning to turn his room into a dance studio. Trust me when I say her brother is not fond of this plan. But we may actually flip flop the rooms since he wont be around as much to give her a few years in the larger room. All it would require is some new paint and a furniture swap! I might go with neutrals instead of the bright colors they now have so that we can flip again if needed. haha –we love all the little quirks in our old house. So many different possibilities! Looks great! Don’t worry we are getting ready to do musical bedrooms too! Whatever makes it easier. Love how you did the names like a crossword- very clever! that’s sweet that the oldest still likes to be with the younger siblings! that’s sweet — also, congrats on #6, I’m not sure if I knew you had another one yet 🙂 Or maybe I did know but just sort of forgot! So how is this arrangement working out with Nora getting ready for school while the boys are still sleeping? I think it is a great idea to have them all together. It makes for a good night of sleep for the whole family. it’s going fine — our kids all wake up really early anyway, so we get her up at 6:30 and the boys are usually awake by 6:45-7:00ish. If they DO wake up with her at 6:30, they are usually fine! You are definitely NOT alone in this. Not long after her younger brother was born our oldest girl turned four. As a big girl birthday gift we moved her out of the nursery, decorated a new room with a fun new dollhouse style bed with trundle and all kinds of fun decor for her. She loved the room but rarely wanted to sleep alone there. 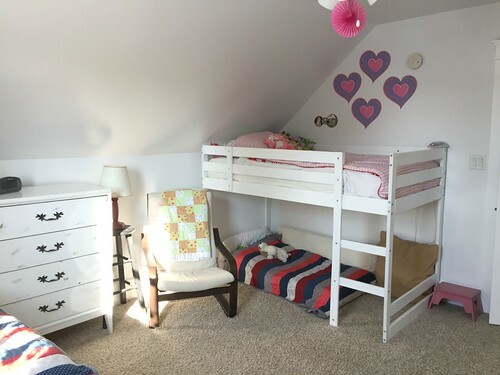 We worked with it on and off for awhile and then as her brother was a toddler crib escape artist we moved him to sleeping on her trundle and from there we’ve switched them back and forth between their two bedrooms numerous times with their beds in bunk bed formation and separately (convertible bunk bed set from Craigslist for the win). You just do what works. She’s now nine and he’s 5 and they still share a room. Often times they still end up in the same bed before morning light. I couldn’t care less. At some point they’ll be too big for this, but in the meantime I think they bond so much being close together and I know for sure we’re all getting more sleep. One good thing about moving furniture is you get to clean under it. What a great feeling for a few days. I love a “new” room and it is the most frugal. exactly! I actually really do enjoy being able to thoroughly clean the rooms whenever we move furniture around! Sounds like my family growing up! Oh Andrea! I can TOTALLY relate! We have 4 bedrooms upstairs and when the 6 older kids were all still up there, I think we had EVERY combination possible – tried. 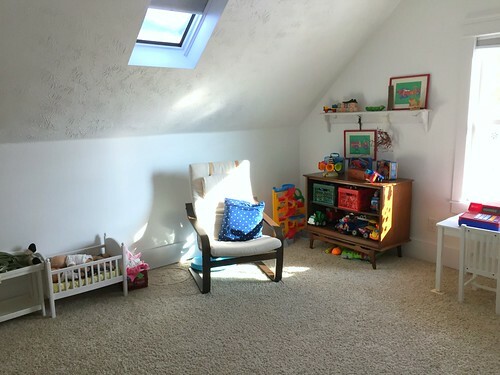 I wouldn’t have changed a thing – except maybe doing more neutral paint on the walls – I cannot even remember how many layers of paint are on those walls upstairs! We’re looking at changing them all up again this summer! It’s all good though! Love doing it! haha — well at least I went with white paint, so we hopefully won’t have to repaint them every time we switch up the furniture! My girls are well into tween/teen years and they still sleep together even though they have their own rooms. I think it’s nice they like each other and like to be together. As long as everyone is safe and getting sleep, go for it. That’s great you found a solution and everyone’s happy. 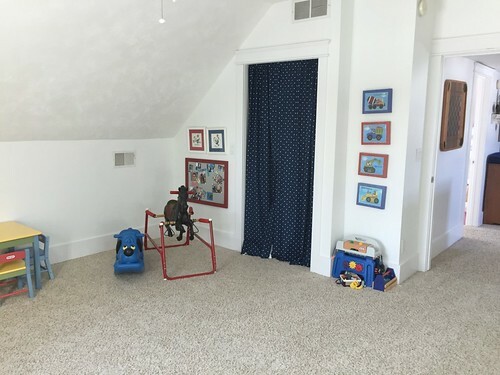 Just curious….why did you remove the door from the boys’ bedroom? haha — one less door for them to slam! I have to admit….I chuckled loudly at your answer. But, boy do I understand that one. I have to park the vacuum in front of the gate to prevent insanity. Mine….not theirs. When I noticed you had removed it, I wondered if it was to save little fingers from getting smashed. That’s another fear of mine. yes, fingers too — but mostly just slamming! 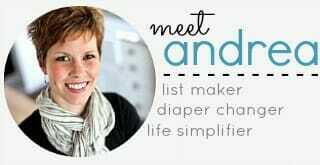 I wish I had been as practical as you when I was a young mother, Andrea. I love that you do what works for your children and your family, from room setups to food to schedules (meaning not overscheduling). I send so many of your blog links to my daughter as she raises her daughter to encourage her to remain true to what works best for her, her husband, and their child! Thanks for passing my blog along to your daughter!! In many countries, kids all sleep with their parents, it’s highly unusual to leave small children in rooms alone to sleep. I find big dark rooms scary too! 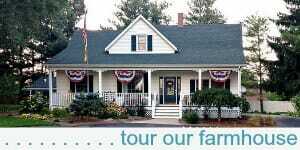 Our first house had three bedrooms and everyone said it was too small cause each child wouldn’t have their own room. 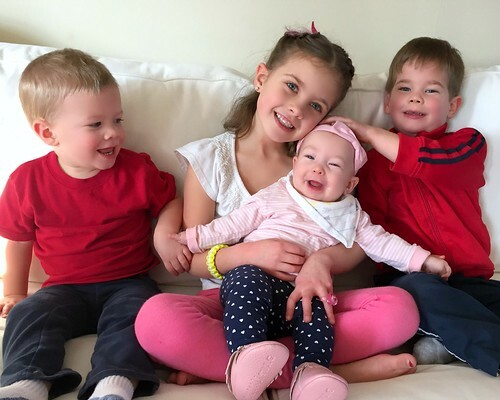 I told them all three of my kids shared a room and people couldn’t believe it. We get the same thing…7 kids plus one on the way with 4 bedrooms. How do we possibly fit?! Boys in the basement bedroom. 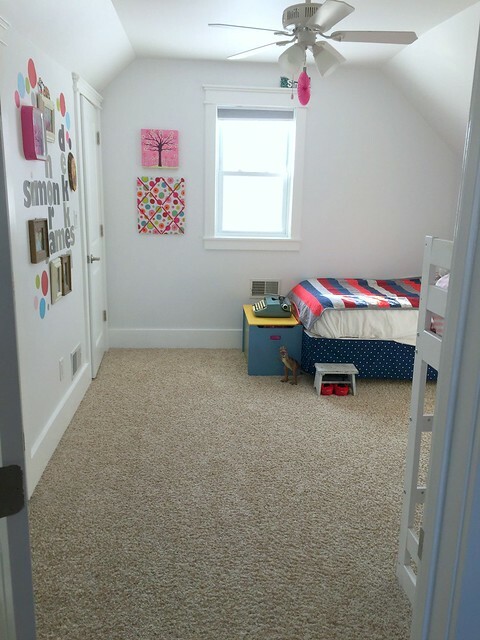 Baby in the main floor bedroom and the 4 girls in upstairs bedroom. We may get some interesting moments in the teenage years (oldest girl is 10)…but they’ll have to deal! We do have a fan running in the room to block out the noises the seem to annoy each other. wow…. congrats to you on the soon-to-be little one!! Yes Ruth! My husband is Korean and he grew up sleeping in one bedroom on mats with his whole family. He had a bunkbed that he never slept on in another room. To this day he often brings out a big stack of blankets and pillows and he, the kids and often his grandma and sister will all spread out on blankets in the living room when we have them over for visits. It feels familiar for all of the adults and my kids are in heaven having a sleepover with their favorite grownups like that. They fall asleep quickly and without drama. I’ve often awakened to realize the dog and I are the only ones who slept in an actual bed! As long as we all slept…awesome. aww, that’s sweet! And yes, our kids would LOVE having a big slumber party with their aunts and grandma! 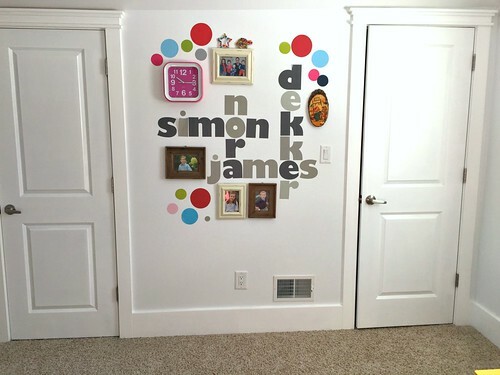 This is a perfect example why it is good to not go crazy with wall paper borders, paint, etc when decorating rooms (especially kids’ bedrooms). You could switch it all around and it still looks neat and polished. 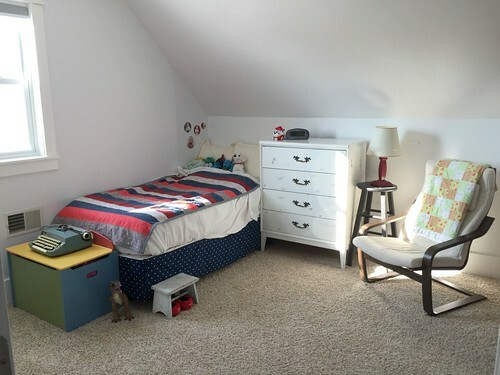 Imagine if you had painted the walls purple or pink in Nora’s room and then put the boys red/blue stuff in there. Both rooms still look nice after their little switcheroo, which, you are right, may only last for a few months and Nora might decide to kick them out!